You would expect we would know the earth and what lives on it by now. But that’s not the case, there are still new species to be discovered. 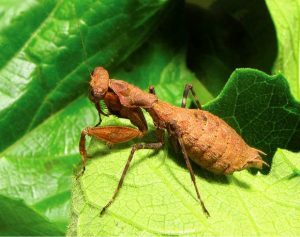 Last year a new mantis species has been discovered in Rwanda, Africa. Not even a previously know species in a different area or country, but a new species alltogether. Scientists found it in Rwanda’s mountainous Nyungwe National Park. This species got the name Dystacta tigrifrutex, a name inspired on a bush tiger. The researchers found out that the female of this mantis hunts like a tiger. They claim it does not sit and wait until a prey walks by, but actually walks around untill it stubles upon a prey insect. It will then approach carefully and attack. Only the female has been seen showing this behavior, the male is much smaller and lives in the foliage. The female hunts on the ground. The scientists found the new species by setting light traps. As described on my page here, a light trap is a white sheet on which strong light is pointed. At night all kinds of moths and other flying insects are attracted to the light and will land on the white sheet. One day a male of the new bush tiger mantis species landed on the sheet and was recognized as a new species. Later a female was found too. Luckily for the researchers she produced an ootheca which hatched dozens of nymphs. In that way they could observe all live stages of the new species of mantis and confirm that the male that was found was really the same species. It makes me wonder how much is still out there… For the insect enthousiasts that want to breed or keep mantises, this species is not the best to be kept as a pet. It is very small and brown without any interesting extra features.